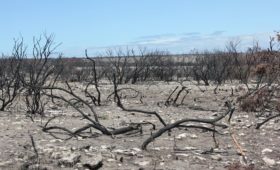 “Following the devastating Knysna fires, there has been a lot of speculation as to how nature will recover”, says Cobus Meiring of the Southern Cape Landowners Initiative (SCLI). 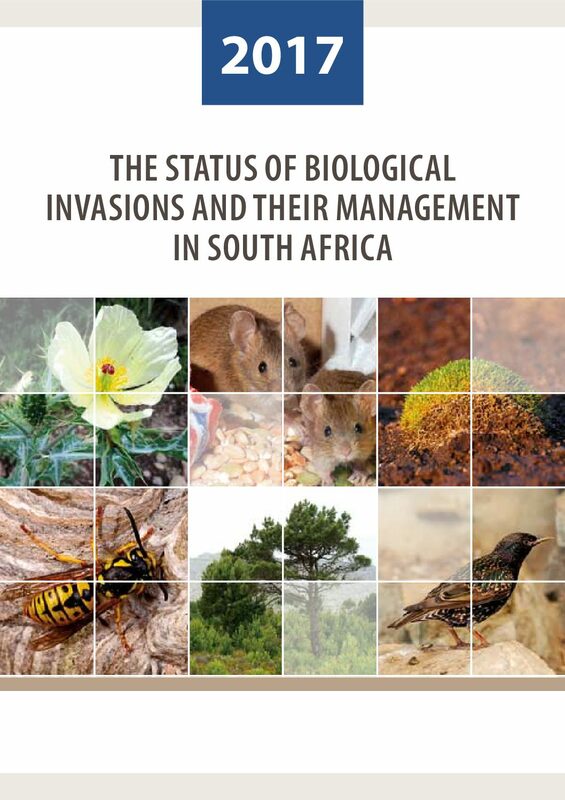 Because of very high densities of invasive alien plants in the Southern Cape, one would expect that there will be aggressive regrowth of invasive species e.g. black wattle, Rooikrans, Port Jackson, pine and Blackwood. The extent of invasive alien plant growth has been one of the key factors causing the wildfire to be as destructive as it was. Fynbos (or plant species indigenous to the Southern Cape), are dependent on (periodic) fire for regeneration, and very hot fire is not necessarily a bad thing (within the context). 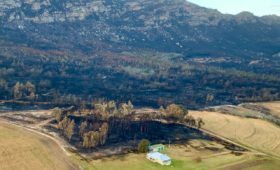 However, when the fire is hot in the extreme, such as were the case with the Knysna fire (where temperatures are speculated to have reached 2 000 degrees Celsius in places), then the underground seed bank is destroyed, which may have a detrimental effect on regrowth patterns. 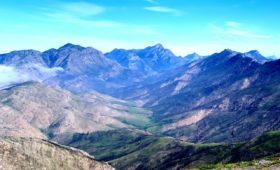 Regular field visits by team members of SCLI and the Garden Route Rebuild Initiative (GRRI Environmental), to monitor plant regrowth patterns in the Brenton corridor, reveals healthy indigenous plant regrowth. On the downside however, growth of wattles, Port Jackson and Blackwood is also visible and scattered all over. Climate factors, such as limited rain and cool weather, are slowing down invasive plant regrowth, but that may change very soon, as summer conditions approach and more consistent rain patterns kick in in October and November. Landowners in areas affected by the wildfires now stand a good chance of gaining the upper hand over invasive alien plants, now that nature has provided them with a “clean slate”. At the moment, the invasive alien plant regrowth monitored in the Brenton is slightly too small for herbicide application, and landowners are advised to wait a little while longer before considering the foliar application of herbicide. 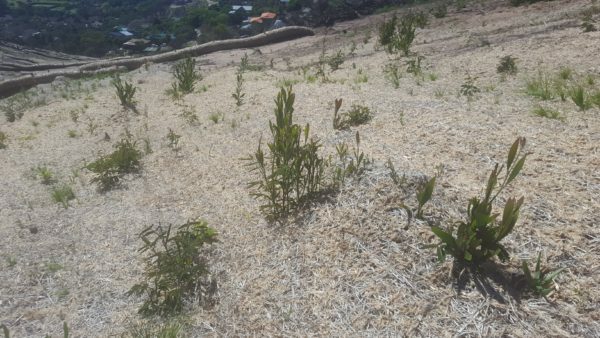 Although not all experts agree on hand pulling invasive seedlings (such as wattle), because of the potential soil disturbance triggering more regrowth, it certainly is an option, given the destruction already caused. 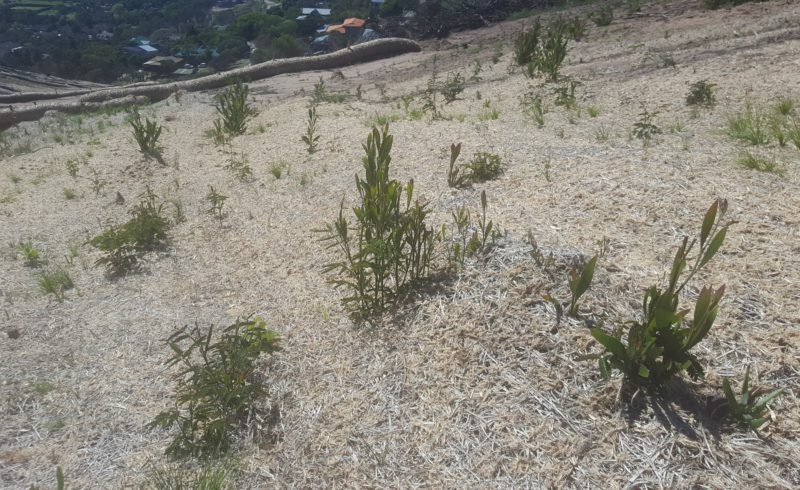 Regrowth of invasive alien plants, following the Knysna fires, has been slow but steady. 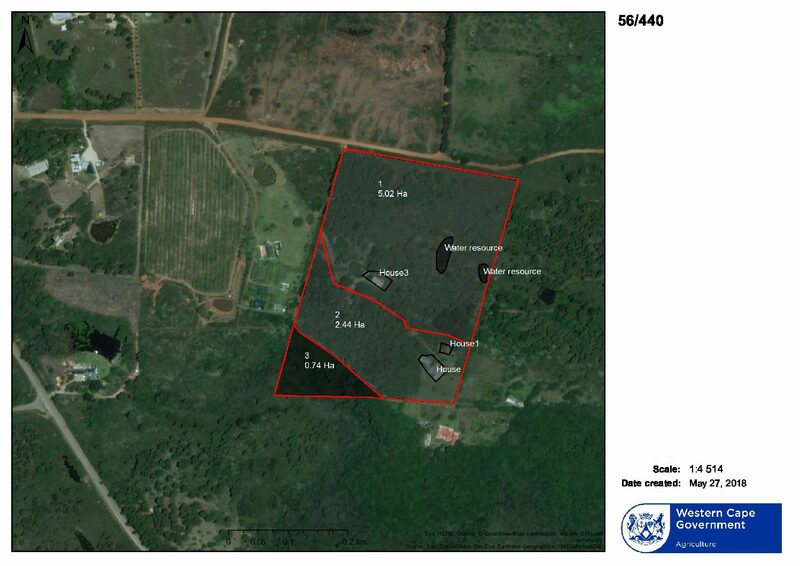 Landowners are advised to closely monitor the land and not to postpone addressing the situation. Black wattle resprouting is visible growing through bio-blankets, deployed to stabilise burnt and exposed slopes in Brenton.